Draft: 2007, Boston Red Sox, 5th rd. William Scott Middlebrooks… Married Jenny Dell (2/14/16), an NFL reporter for CBS Sports… 2007 graduate of Liberty Eylau High School (TX)… As a senior, hit .555 with 22 doubles, 5 HR, 48 RBI and 28 SB; also went 13-0 as a pitcher… Also played quarterback, kicker and punter on the football team, where he was teammates with former NFL running back LaMichael James… Turned down a scholarship to play baseball and football at Texas A&M…Hobbies: Hiking, grilling, spending time with family and golfing…Signed by: Jim Robinson. Appeared in the majors for the 6th straight season...Played in 78 games for Round Rock (AAA) and led the team in HR (23) and RBI (64)... Had 2 separate stints on the DL: 4/18-5/31 (left pinky fracture) and 7/9-21 (left groin strain)...Hit .303 with a .384 OBP and .605 SLG % vs LHP...Had his contract selected on 9/1 and made his TEX debut on 9/3...Started 6 games at 3rd base and 1 game at 1st base...Had a pinch-hit triple in both games of a doubleheader, 9/6 at ATL; was the first ML player to do so since 1913...Went 2-for-6 as a pinch-hitter. Was a non-roster invitee to Milwaukee's spring training camp and opened the season at Colorado Springs (AAA)… made starts at 3rd base (54), DH (6), and 1B (2) for the Sky Sox…beginning 5/27, batted .376 (50-133) with 8 HR and 37 RBI in final 36 games with Colorado Springs to raise batting average from .174 to .282…had 7 HR and 22 RBI in 17-game span, 6/7-23, including HR in 3 straight games (4 total HR), 6/7- 10…had a .346 (44-127) average in 35 home games…had 3 4-hit games with the Sky Sox…was on DL from 4/12-24….had contract purchased by MIL on 7/4 and made 8 starts at 3B for the Brewers…went 3-for-27 at the plate, going hitless in final 12 at bats following RBI 1B on 7/16 at CIN…was 0-for-2 as a pinch-hitter and 0-for-17 vs. RHP…had 25 errorless chances at 3B…was placed on the 15-day DL on 7/25 with a lower right leg strain sustained the day before at CHI…appeared in 3 games on rehab assignment at Wisconsin (Low A) and Biloxi (AA) before being activated and outrighted to Colorado Springs on 8/30…did not play the rest of the season. Limited to 63 games for the Red Sox, his lowest total in three Major League seasons, due to two stints on the disabled list with two different injuries...Began the season on Boston's Opening Day roster and made his second career Opening Day start (also 2013)...Played in four games for the Red Sox before being placed on the 15-day DL on 4/6 (retro to 4/5) with a right calf strain…was activated on 4/25...Led the Red Sox in games played (62) and starts (57) at third base despite his time spent on the DL...His .972 fielding percentage at third base (four errors in 141 TC) ranked 3rd in the AL (min. 500 innings)...Drove in two runs on a 9th-inning single on 5/15 at MIN to tie the game…marked his second career game-tying hit in the 9th inning (game-tying solo homer off Mariano Rivera on 9/8/13 at NYY)...Placed on the 15-day DL for the second time on 5/17 with a fractured right index finger…activated from the DL on 8/1…after his activation, appeared in 42 of the club's 48 games through his last game on 9/21...Hit .292 (14-for-48) with RISP, compared to .162 (27-for-167) in all other at-bats…went 7-for-12 (.583) with 10 RBI with the bases loaded. Appeared in 94 games over 2 stints with the Red Sox, leading the team with 92 games at 3B...Combined for 27 home runs and 84 RBI in 139 games between BOS and Triple-A Pawtucket. Of his 79 hits with BOS in 2013, 35 went for extra bases (18 2B, 17 HR). Tied for 2nd in the AL with 2 grand slams (9/4 vs. DET and 9/25 at COL)...Had 2 multi-HR games (3 on 4/7 at TOR and 2 on 9/25 at COL). Had a .192 AVG (39-for-203) with 13 doubles, 9 homers, and 25 RBI in 53 games with BOS to begin the season before being optioned to Triple-A Pawtucket on 6/25...Came back to hit .276 (40-for-125) with 5 doubles, 8 homers, 24 RBI, and 11 walks over 41 games in 2nd stint with BOS following 8/10 recall. Made 1st pro defensive appearances outside of 3B, with 2 games at 2B (no starts; 8/21 at SF and 8/27 vs. BAL and 1 game at 1B (1 start; 9/21 vs. TOR). Knocked career-high 4 hits, including a career-high 3 home runs, in 6th game of the season on 4/7 at TOR, a 13-0 win...Was his 2nd career-multi-homer game (2 HR, 5/7/12 at KC) and matched a club single-game record for the 26th time, 1st since Dustin Pedroia on 6/24/10 at COL...Was the 21st Red Sox player to hit 3 HR in a game and 3rd 3B to do it, along with Bill Mueller on 7/29/03 at TEX and Jim Tabor on 7/4/39 at PHA (G2)...At 24 years old, was the 5th-youngest Red Sox to homer 3 times in a game, the youngest since Jim Rice on 8/29/77 vs. OAK (also 24). Also doub ed, scored 4 runs, and drove in 4 in that 4/7 3-HR game...His 14 total bases were the most by a major leaguer all season, the most by a Red Sox since Dustin Pedroia's 15 TB on 6/24/10. Laid down 1st ML sacrifice bunt on 5/17 at MIN...Was the 2nd of his professional career and 1st since 2008 pro debut with Single-A Lowell. Missed 1 game on 5/8 vs. MIN after leaving 5/7 contest in the 7th inning due to right side pain. Placed on the 15-day DL on 5/24 due to a lower back strain...Activated on 6/10 after a 5-game rehab stint with Pawtucket from 6/4-9 over which he hit .294 (5-for-17) with 2 homers, 6 RBI, and 4 walks. Set season highs with an 8-game hit streak (.462, 12-for-26) and 11-game on-base streak (.441, 15-for-34, 7 BB, HBP) immediately following 8/10 recall. Drove in both of BOS' runs in a 2-1 win on 9/3 vs. DET with a 2-run single in the 5th inning off Max Scherzer. Named AL Co-Player of the Week for 9/2-8, along with teammate Mike Napoli...Was his 2nd career weekly honor (also 6/18-24/12)...Hit .464 (13-for-28) with a double, games 9/4-6, the 1st Sox 3B to do that since Mike Lowell from 5/8-10/07. Hit a game-tying, 9th-inning homer on 9/8 at NYY off Mariano Rivera, the 30th HR of his career in his 154th ML game...It marked the 4th-fewest ML games to 30 homers by a Red Sox. Was 3-for-5 in a 20-4 win on 9/4 vs. DET...Doubled and hit 2nd career grand slam (also 5/6/12 vs. BAL, his 1st ML home run), finishing with 4 RBI. Totaled 9 RBI over a 6-game stretch from 9/3-8. Had multiple hits in a career-high 5 straight games from 9/4-8 (.500, 11-for-22). Tied for the team lead (also Mike Napoli and David Ortiz) with 6 homers in September, tied for 4th most in the AL. Collected a career-high 7 RBI on 9/25 at COL, knocking a 3-run HR and a grand slam...Was 3rd career multi-HR game and 3rd grand slam (both 2nd in 2013)...The 7 RBI tied for the most in a game in the majors this season (6 others including teammate Shane Victorino on 8/27 vs. BAL). Played 45 games with the PawSox, including rehab, and hit .268 (48-for-179) with 5 doubles, 10 homers, and 35 RBI...Hit safely in his last 8 Triple-A games at .333 (11-for-33) prior to 8/10 recall. Had a pair of 2-homer games for Pawtucket, on 6/30 and 7/3, both vs. Scranton/Wilkes-Barre (NYY). Went 4-for-5 with 2 homers, a walk, and a franchise-record-tying 8 RBI on 7/3...Was the most RBI for a PawSox since Freddy Garcia on 7/27/00. Led the PawSox with 18 RBI in 26 games in July, his only full month in Triple-A. Started the club's first 8 games at 3B and appeared in 10 games overall during BOS' run to the World Series Championship...Had a hit in 4 of 9 games with a PA…Reached safely in all 4 ALDS games vs. TB… Played in 5 ALCS Games vs. DET, making 4 starts…Pinch ran for Xander Bogaerts in the 9th inning of Game 6… Pinch hit in the 7th inning in Game 3 of the World Series in STL and was charged with an interference error in the 9th inning, which allowed the game-ending run to come home. : Played 75 games in ML debut...Was BOS's regular 3rd baseman from 5/2 call-up until a season-ending wrist fracture on 8/10, hitting .288 (77-for-267) with 14 doubles, 15 HR, and 54 RBI.Was the 7th Red Sox player to record 15 home runs in his 1st ML season, 1st since Ellis Burks in 1987 (20).Had the most homers and the most RBI by a Red Sox in a full season age 23 or younger since Burks in 1987 (20 HR, 59 RBI)...Was the youngest Red Sox to play at least 50 games at 3rd base since Glenn Hoffman in 1980.His 15 homers were the most by a Red Sox in a rookie season since Brian Daubach (21) and Trot Nixon (15) reached the mark in 1999...They were the most homers by a Red Sox in his 1st 75 tilts in 25 years (Sam Horn, 1987-88 and Ellis Burks in 1987), while his 54 RBI represented the most to start a career by a Red Sox since Fred Lynn's 1st 75 games from 1974-75 (61 RBI).Among AL rookies with at least 275 plate appearances, finished 2nd in SLG (.509), 3rd in AVG and OPS (.835), and 4th in OBP (.325)...Overall, finished 4th among AL rookies in hits (77), RBI, multi-hit games (21), home runs (tied), extra-base hits (29), and total bases (136), and was 5th in doubles (14).Posted a .300 clip (27-for-90), a .556 SLG against lefties, tallying 5 doubles and 6 homers vs. southpaws.Hit .321 (25-for-78) with a .972 OPS and 6 homers with runners in scoring position...Ranked 5th among AL players (min. 80 PA) with a .565 SLG in the 7th inning or later.Batted .370 (17-for-46) in 16 Interleague games, 5th best among AL qualifiers...Texas native hit .421 (8-for-19) with a .947 SLG against TEX, the 4th-best single-season mark by a Red Sox player (min. 20 PA).Ranked 5th all-time among Red Sox rookie qualifiers with both a .538 SLG and .858 OPS before the All-Star break (since 1933)...Were the best 1st-half marks by a Boston rookie since Fred Lynn in 1975.Boston went 43-32 (.573) when he appeared in a game, including a 41-29 (.586) mark in his 70 starts.Became the 1st player ever to tally at least 6 extra-base hits (3 2B, 3 HR) and 9 RBI over his 1st 4 ML games (since RBI became an official statistic in 1920)...His 9 RBI matched the ML record for a player's 1st 4 contests, joining PIT's Jack Merson in 1951, STL's Joe Cunningham in 1954, SF's Dave Kingman in 1971, SEA/BOS's Arquimedez Pozo in 1995-96, and NYM's Mike Jacobs in 2005 (Source: Elias)...Notched an extra-base hit in each of his 1st 5 ML games from 5/2-8, joining STL's Enos Slaughter (1st 5 games from 4/19-23/38) as the only players to do that since 1900...His 7 extra-base hits (4 2B, 3 HR) matched the most in a Major Leaguer's 1st 5 games since at least 1916 (also CIN's Chris Dickerson in 2008).Made big league debut on 5/2 and went 2-for-3 with a walk and a stolen base vs. OAK...Was the 1st Red Sox to reach 3 times in a ML debut since Morgan Burkhart on 6/27/00 vs. BAL (2 H, BB) and the 1st Red Sox with 2 hits and a stolen base in his debut since Steve Dillard on 9/28/75 vs. CLE (2 H, SB).Hit a game-tying grand slam for 1st ML homer in the 5th inning on 5/6 vs. BAL, the 1st bases-loaded situation of his career...Was 1st Red Sox with a slam for his 1st homer since Daniel Nava on 6/12/10 vs. PHI.Went deep twice in his 4th ML game on 5/7 at KC, the 1st Red Sox with a multi-homer effort within his 1st 4 career tilts since Dave Stapleton (2 in 2nd game, 5/31/80 vs. MIL)...Joined Billy Conigliaro (3 HR, 4/11-17/69) as the only Red Sox since 1918 with 3 homers in their 1st 4 ML games.With a HR and 2 RBI on 5/13 became the 3rd-ever player with at least 4 homers and 13 RBI over his 1st 10 ML games, joining KC's Mark Quinn in 1999 and SEA's Alvin Davis in 1984.Knocked his 5th homer on 5/21, a game-tying 2-run shot in the 8th inning to become the 1st Red Sox 23 years old or younger to hit a tying or go-ahead homer in the 8th inning or later since Nomar Garciaparra hit a go-ahead solo homer in the 11th inning on 4/24/97 at BAL.Hit .316 (30-for-95) with 6 homers and 21 RBI in 24 games in May, the 1st Red Sox rookie to tally at least 6 homers and 21 RBI in his 1st month in the majors since at least 1921...It was the most homers in a month by a Red Sox rookie since Brian Daubach cranked 7 in August 1999.Drove in at least 4 runs on 3 occasions, doing so on 5/6 vs. BAL (4), 5/7 at KC (5) and 6/21 vs. MIA (4)...According to Elias, was the 4th Red Sox rookie to do that before the end of June, along with Mike Greenwell in 1987 (4), Ted Williams in 1939 (3), and Walt Dropo in 1950 (3).Hit .331 (47-for-142) with 9 homers and 33 RBI over his 1st 40 ML games through 6/23...According to Elias only 4 other players since 1920 (the 1st year in which the MLB kept track of RBI) compiled those marks in AVG, home runs, and RBI over their 1st 40 career ML games: PHI's Buzz Arlett in 1931 (10 HR, 38 RBI, .378 AVG), CLE's Ken Keltner in 1937-38 (9 HR, 34 RBI, .335 AVG), SEA's Alvin Davis in 1984 (11 HR/34 RBI/.340 AVG), and STL's Albert Pujols in 2001 (14 HR, 44 RBI, .367 AVG).Named AL Player of the Week for 6/18-24...Went 10-for-16 with 3 doubles, 3 homers and 10 RBI and led the majors (min. 17 PA) in AVG (.625), OBP (.632), SLG (1.375), total bases (22), and RBI (tied).Homered in back-to-back tilts 5/6-7, 6/20-21, and 8/7-8...Extra-base hits in 5 straight games 5/2-8 and 6/19-23.Went 1-for-2 with a sac fly and 4 RBI as a pinch-hitter, including a 3-run, 7th-inning shot on 8/7 vs. TEX.Hit safely in 13 of his last 18 games of the season at .300 (18-for-60), beginning with a career-high 9-game hit streak from 7/23-8/1 (.394, 13-for-33).Began the season with 24 games for Triple-A Pawtucket...At that time, was pacing the Sox farm system and ranked 2nd in the International League with 9 homers (tied) and 27 RBI...Also placed among IL leaders in hits (T-2nd, 31), SLG (3rd, .677), total bases (4th, 63), extra-base hits (T-5th,13), runs (T-5th, 18), and AVG (T-8th, .333). Played most of the season with Double-A Portland and was named to both the EasternLeague's mid- and post-season All-Star teams as well as the Topps Double-A All-Star squad...Concluded the season at Triple-A Pawtucket after a promotion on 8/19...Missed time on the disabled list from6/11-29 with a right triceps strain...Batted a combined .285 (125-for-439) with 26 doubles, 23 homers, 94 RBI, 62 runs and 10 stolen bases in 116 totalgames...His 23 home runs more than doubled his previous career total of 2 over the 1st 3 years of his pro career...Hit .373 (28-for-75) with 2 outs and runners in scoring position between the 3 stops...Tied for lead among Red Sox minor leaguers in RBI, ranked 3rd in home runs and was 9th in AVG...Selected to the XM All-Star Futures Game roster as part of the U.S. squad and started the game at 3rd base,going 1-for-2 in a 6-4 win over the World Futures...At the time of his 8/19 promotion to Pawtucket, was leading the Eastern League with 80 RBI...Overall, placedamong circuit leaders in RBI (4th), SLG (4th, .520) and AVG (8th)...Went deep in 3 of 4 games on rehab with the Short-A Spinners, including homers in 3 straight tilts from 6/26-28...Following the season, batted .250 (14-for-56) with 4 home runs and 11 RBI in 13 games for Scottsdale in theArizona Fall League and was honored as an AFL Rising Star. Spent the entire season with High-A Salem and was named to both the Carolina League'smid-season and post-season All-Star Teams...Topped Salem with 70 RBI and finished 2nd on the club in homers (12), total bases (191) and extra-base hits (45)...Ranked among Red Sox minor leaguers in RBI (5th), AVG (7th, .276), doubles (8th, 31) and homers (T-8th, 12)...Hit .362 (25-for-69) in April, including a season-high, 13-game hit streak from 4/24-5/10 over which he batted.367 (18-for-49)...Named the Red Sox Minor League Offensive Player for July after hitting .333 (32-for-96) with 6 home runsand 27 RBI in the month...Rated by Baseball America as the best defensive 3rd baseman and as having the best infield arm in theCarolina League...Also rated as the best infield arm in the Red Sox system for the 4th time...Named the No. 13prospect in the Carolina League by the publication. Played his 1st full minor league season with Single-A Greenville...Ranked 2nd on the Drive with 25 doubles, 57 RBI and 218 total bases...Also finished among club leaders inat-bats (3rd, 374), walks (3rd, 48) and hits (4th, 99)...Tallied the team's 2 longest hitting streaks of the year, a 17-game run from 7/16-8/2 and a 16-gamer from 8/15-31...Named Red Sox Minor League Offensive Player of the Month for July (.337, 5 HR, 26 RBI)...Played in 5 postseason games with Greenville...Following the season, rated by Baseball America as having the best infield arm in the Red Sox system for the3rd straight season. Led Short-A Lowell with 17 doubles in his 1st pro season...Also ranked among club leaders in games (2nd, 59), stolen bases (T-2nd, 10), hits (3rd, 53) and extra-basehits (3rd, 20)...Was successful in all 10 stolen base attempts...Paced New York-Penn League 3rd basemen with a .927 fielding percentage (9 E/123 TC)...Connected for a 12th-inning walk-off single on 8/9 at "Futures at Fenway" vs. Hudson Valley...Homered and led the Spinners with a .500 AVG (6-for-12) in 3 postseason games. November 2, 2018 3B Will Middlebrooks elected free agency. September 25, 2018 Clearwater Threshers activated 3B Will Middlebrooks from the 7-day disabled list. April 5, 2018 3B Will Middlebrooks assigned to Clearwater Threshers from Lehigh Valley IronPigs. January 3, 2018 Philadelphia Phillies signed free agent 3B Will Middlebrooks to a minor league contract and invited him to spring training. 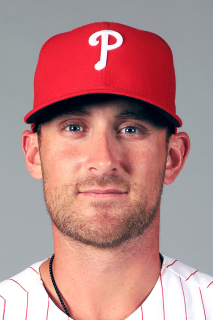 January 3, 2018 3B Will Middlebrooks assigned to Lehigh Valley IronPigs. October 10, 2017 3B Will Middlebrooks elected free agency. October 10, 2017 Texas Rangers sent 3B Will Middlebrooks outright to Round Rock Express. September 1, 2017 Texas Rangers recalled 3B Will Middlebrooks from Round Rock Express. July 22, 2017 Round Rock Express activated 3B Will Middlebrooks from the 7-day disabled list. July 9, 2017 Round Rock Express placed 3B Will Middlebrooks on the 7-day disabled list. June 1, 2017 Round Rock Express activated 3B Will Middlebrooks from the 7-day disabled list. April 18, 2017 Round Rock Express placed 3B Will Middlebrooks on the 7-day disabled list. November 11, 2016 Texas Rangers signed free agent 3B Will Middlebrooks to a minor league contract and invited him to spring training. October 3, 2016 3B Will Middlebrooks elected free agency. August 30, 2016 Milwaukee Brewers sent 3B Will Middlebrooks outright to Colorado Springs Sky Sox. August 27, 2016 Milwaukee Brewers sent 3B Will Middlebrooks on a rehab assignment to Biloxi Shuckers. August 24, 2016 Milwaukee Brewers sent 3B Will Middlebrooks on a rehab assignment to Wisconsin Timber Rattlers. July 25, 2016 Milwaukee Brewers placed 3B Will Middlebrooks on the 15-day disabled list. Right lower leg strain. July 4, 2016 Milwaukee Brewers selected the contract of 3B Will Middlebrooks from Colorado Springs Sky Sox. April 24, 2016 Colorado Springs Sky Sox activated 3B Will Middlebrooks from the 7-day disabled list. April 12, 2016 Colorado Springs Sky Sox placed 3B Will Middlebrooks on the 7-day disabled list. April 4, 2016 3B Will Middlebrooks assigned to Colorado Springs Sky Sox. December 15, 2015 Milwaukee Brewers signed free agent 3B Will Middlebrooks to a minor league contract and invited him to spring training. December 2, 2015 3B Will Middlebrooks elected free agency. October 5, 2015 San Diego Padres recalled 3B Will Middlebrooks from El Paso Chihuahuas. July 22, 2015 San Diego Padres optioned 3B Will Middlebrooks to El Paso Chihuahuas. December 20, 2014 San Diego Padres traded C Ryan Hanigan to Boston Red Sox for 3B Will Middlebrooks. August 1, 2014 Boston Red Sox activated 3B Will Middlebrooks from the 15-day disabled list. July 18, 2014 Boston Red Sox sent 3B Will Middlebrooks on a rehab assignment to Pawtucket Red Sox. July 1, 2014 Boston Red Sox sent 3B Will Middlebrooks on a rehab assignment to Pawtucket Red Sox. June 13, 2014 Boston Red Sox sent 3B Will Middlebrooks on a rehab assignment to Pawtucket Red Sox. April 25, 2014 Boston Red Sox activated 3B Will Middlebrooks from the 15-day disabled list. April 21, 2014 Boston Red Sox sent 3B Will Middlebrooks on a rehab assignment to Pawtucket Red Sox. April 6, 2014 Boston Red Sox placed 3B Will Middlebrooks on the 15-day disabled list retroactive to April 5, 2014. Right calf strain. August 10, 2013 Boston Red Sox recalled 3B Will Middlebrooks from Pawtucket Red Sox. June 25, 2013 Boston Red Sox optioned Will Middlebrooks to Pawtucket Red Sox. June 10, 2013 Will Middlebrooks roster status changed by Boston Red Sox. June 4, 2013 Boston Red Sox sent 3B Will Middlebrooks on a rehab assignment to Pawtucket Red Sox. May 24, 2013 Boston Red Sox placed 3B Will Middlebrooks on the 15-day disabled list. Low back strain. April 10, 2013 3B Will Middlebrooks assigned to Pawtucket Red Sox. November 2, 2012 Boston Red Sox activated 3B Will Middlebrooks from the 60-day disabled list. October 4, 2012 Boston Red Sox transferred 3B Will Middlebrooks from the 15-day disabled list to the 60-day disabled list retroactive to October 2, 2012. May 2, 2012 Boston Red Sox recalled 3B Will Middlebrooks from Pawtucket Red Sox. March 16, 2012 Boston Red Sox optioned Will Middlebrooks to Pawtucket Red Sox. November 18, 2011 Boston Red Sox selected the contract of Will Middlebrooks from Pawtucket Red Sox. August 19, 2011 Will Middlebrooks assigned to Pawtucket Red Sox from Portland Sea Dogs. July 14, 2011 Will Middlebrooks roster status changed by Portland Sea Dogs. July 9, 2011 Portland Sea Dogs placed 3B Will Middlebrooks on the temporarily inactive list. June 30, 2011 Portland Sea Dogs activated 3B Will Middlebrooks from the 7-day disabled list. June 26, 2011 sent 3B Will Middlebrooks on a rehab assignment to Lowell Spinners. June 11, 2011 Portland Sea Dogs placed 3B Will Middlebrooks on the 7-day disabled list. Right triceps strain. April 2, 2011 3B Will Middlebrooks assigned to Portland Sea Dogs from Salem Red Sox. February 26, 2011 3B Will Middlebrooks assigned to Boston Red Sox. April 5, 2010 Will Middlebrooks assigned to Salem Red Sox from Greenville Drive. March 20, 2010 3B Will Middlebrooks assigned to Boston Red Sox. April 23, 2009 Will Middlebrooks assigned to Greenville Drive from Lowell Spinners. August 15, 2007 Boston Red Sox signed 3B Will Middlebrooks.